Driving a pace car in a professional auto race may look easy. But it’s not. As IndyCar fans learned on Sunday, driving a pace car can be pretty treacherous even for somebody with years of experience. GM exec Mark Reuss, who heads up product development for the auto giant, has been driving the pace car at IndyCar’s Detroit Grand Prix for years. 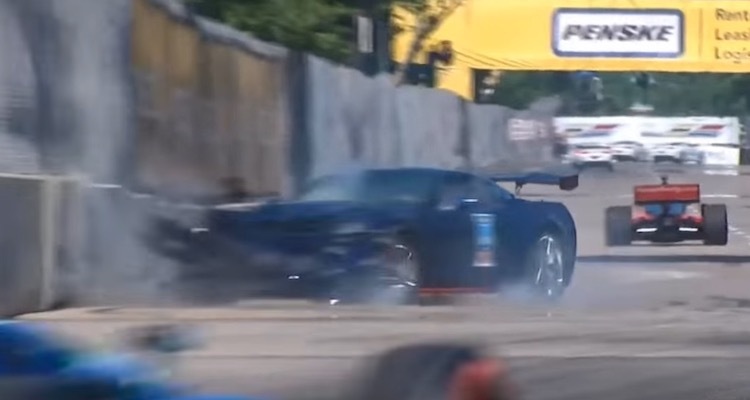 On Sunday he was behind the wheel again on Belle Isle, showing off Chevrolet’s 2019 Corvette ZR1, when he supposedly hit a bump in the road, spun out, and crashed into the wall. In the video you can’t really see Reuss hitting a bump in the road. But that’s the official explanation offered by IndyCar, so we’re sticking to it. Fortunately Reuss was uninjured in the crash. At least not physically. His pride may have taken a little hit. Don’t be surprised if that’s the last time Mark Reuss drives the pace car at the Detroit Grand Prix. After this GM will probably hire a professional driver so they can just cite “human error” if their pace car veers into a wall.